Home/Uncategorized/How to Claw Back Some Time. Not so long ago I was fortunate enough to trial “no e-mail Friday” for the Institute of Directors. It had the immediate effect that it gave me time to focus on areas of the business which need thinking time, and also to just get work done without being disturbed. No e-mail Friday is still a regular part of my working week, and I have certainly benefitted from having a day a week to really focus. I’ve also found out of the benefit of out-sourcing some of the work to a virtual PA which has given me more time. But even with these tools in place, I recently started to realise I was once again running out of time. What has changed? To find out, I started a small experiment by ruthlessly monitoring over the course of a week how often I was distracted from a task I had started. It turns out I’m not as ruthless at time management as I thought I was. So, a couple of weeks ago I turned off all push notifications on my phone and computer. I now decide when I need to read e-mails, texts and interact with social media. Virtually all the pinging noises have disappeared and honestly the sense of relief is fantastic. There is one exception – those times in a project when there is a rapidly fluctuating situation. When this happens I use the e-mail VIP function so if an e-mail quietly pops up in the bottom of my screen, I know I need to look at it in a relatively short space of time. 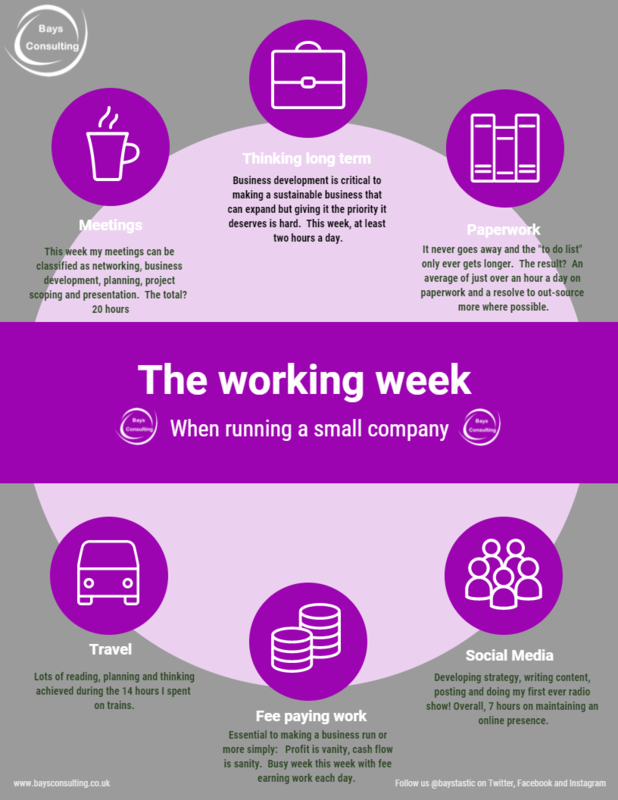 This week I tried a new experiment and recorded what I was doing during the day – the results are shown in the infographic. I managed to create a slightly calmer working environment, but still no-more time. This week I tried a new experiment and recorded what I was doing during the day – the results are shown in the infographic. Looking back, I shouldn’t really be surprised at the results, most of spend an inordinate amount of time travelling to and then sitting in meetings. But, the really interesting result of the week is seeing how much time I’ve gained. If I’d done this experiment last year there would have been a lot less time dedicated to developing business strategy, virtually nothing on social media/online presence, and I spent more time on paperwork. All in all I’ve not run out of time, I’ve filled the time I got back earlier in the year – Bays Consulting has developed new products and now works in new markets. So my advice to claw back some time? Turn off e-mail so you have time to think. Turn off push notifications, it makes the day so much quieter. Out-source that one admin task which infuriates you – it will make you happier. Then get some running shoes, your business might start to move at a much faster rate.